The metallurgical fundamentals of magnesium alloys and their application in engineering were the subject of a lecture by Matthias Gruber. Dr. Gruber is the Vice President of Technology and Production at Magontec. The further development of magnesium alloys is strongly focused on advances of their applications. In this respect, the basic weight advantage over other metals, especially aluminum and steel, is complemented by a wide range of other properties. For high pressure die casting, expertise in metallurgical specifics is crucial in the selection of suitable magnesium alloys. Dr. Gruber introduced his audience in detail to the world of microstructures. He gave a thorough account of their significance in die casting. For industrial applications, the mechanical properties of any alloy must prove to be, above all, practical. In particular, this means flawless castability. For example, avoiding hot tearing requires specific solidification behavior. This can be attained by the controlled addition of rare earth elements. The exact specification for this is given by the evaluation of measured data in combination with micro structural examinations using the electron microscope. In the same way, the lower density of magnesium can be used to design alloys with advantageous property profiles, especially when considering requirements for stiffness, strength and high temperature resistance. The prerequisite for such results is the detailed mastery of the technical production processes. Based on high-purity alloys and special alloys, high-pressure die casting foundries are able to provide their customers with high-strength, lightweight components. They are especially proven in the automotive industry. Structural, bracketry and power train components all benefit from the magnesium alloys that are optimized right down to their microstructures. Leading automobile manufacturers in Europe, Japan and the US depend on these solutions, as do the manufacturers of power tools and electronic components. Always details obtained by intensive and application oriented development decide the optimum composition of alloy constituents. Whether the smallest amounts of aluminum, manganese, silicon, rare earths or other constituents – only proven metallurgical mechanisms provide the ideal behavior of an alloy in practice. Matthias Gruber holds a PhD in engineering from the University of Erlangen (Germany). 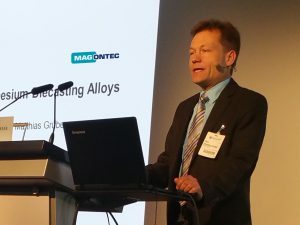 He spoke at a symposium of the International Magnesium Association (IMA) on 17 January 2018 at the Euroguss trade fair in Nuremberg (Germany). The title of his lecture was ‘Advances in Magnesium Die Casting Alloys’. The talk was co-authored by Trevor Abbott PhD, director of Abbottics Pty Ltd, Melbourne (Australia). 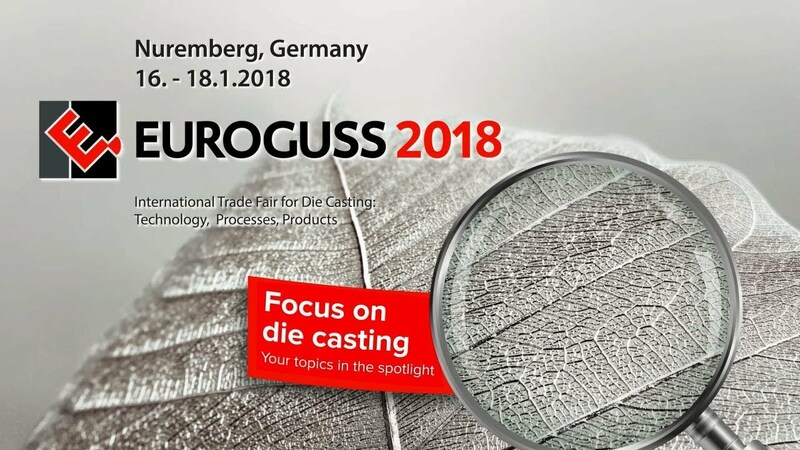 Euroguss attracted more than 15,000 visitors in 2018. Since 1953, Magontec has been a leader in the development of high-performance magnesium alloys with plants in Europe and China. The research network of Magontec covers Europe, China and Australia. Dr.-Ing. 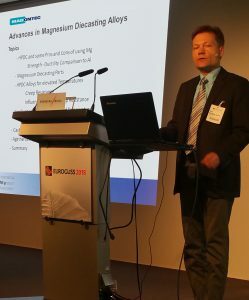 Matthias Gruber at the trade fair Euroguss 2018 during his presentation ‘Advances in Magnesium Die Casting Alloys’.